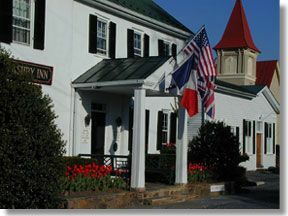 As promised my review of the Qupe' Wine Dinner at The Ashby Inn, Paris, Virginia, continues. The third course of the night was a bite sized pasta filled with macadamia nut butter in a butternut squash broth with ginger and marigold. A very rich dish and the macadamia nut butter was an unusual, but tasty, filling. Not a real big portion but more a tapas style of portion. 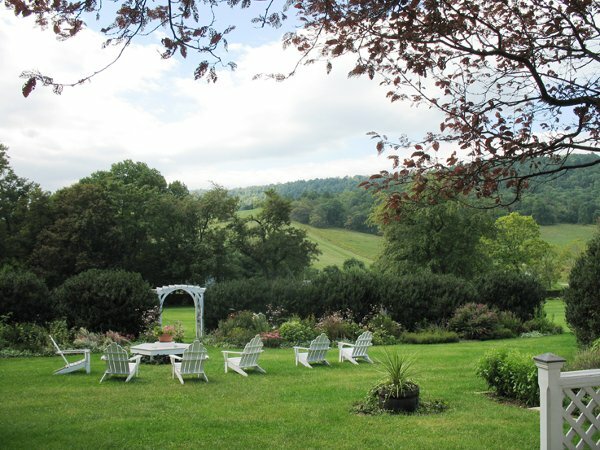 This course was accompanied by two releases of the "Bien Nacido Hillside Estate" Roussanne, the 2003 and the 2008. The 2003 Roussanne, compared side-by-side to the 2008, did not have the same vibrant nose nor was its color as deep as the 2008. I picked up hints of citrus on the nose but wasn't able to pick up much of anything else. 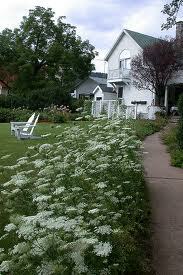 Smelled very thin if you can image that. On the palate I noted hints of citrus and maybe a little honeysuckle. Not a bad wine by any means just much more subtle than the 08. As I like more of an "In Your Face" type of white wine, this one received 3 corkscrews due to its subtleness. Don't know if you can still find this but the 2007 goes for $40 per bottle if that gives you an idea of how pricey it is. The 2008 Roussanne was my favorite of the two. Bright yellow in color, the bouquet was big and bold with scents of mango, peach and other tropical fruit aromas. On the palate this wine did not disappoint. Loads of flavor, lushness and a finish that was borderline perfect! I liked the way this wine kind of clings to the palate. This would have received 5 corkscrews but only received four due to an average bottle price of around $30. Highly recommend for any special occasion or when you just want to splurge on a nice bottle of wine. The fourth course was a sliced duck breast in cherry jus with assorted grains and oregano. Now I love a rare piece of meat and it is so easy to overcook a duck breast that I understand the need to serve it on the rare side. However, I'm afraid this course of duck breast was too rare. Still very tasty but when my plate came out the blood from the duck breast had run all over the plate and made for a less than desirable presentation. I would have thought that the chef or server would have taken the time to clean up the plate before presenting it, but unfortunately it wasn't so. This was the only course of the five that I didn't love the presentation. 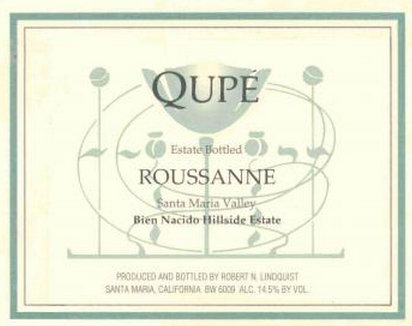 This course was served with the 2008 Qupe' "Sawyer-Linquist Vineyard" Grenache. The 2008 Sawyer-Linquist Grenache was brought to the table and served with the aforementioned duck breast. Now in full disclosure I have to admit that I hardly ever, and I mean ever, drink Grenache. I much prefer a Pinot Noir or something more full bodied than most Grenache. That being said I'll continue with my review. Once the Grenache was poured I noted that it was a light ruby red and not as full bodied looking as I like in a red wine. On the nose I picked up blackberry and raspberry tones with a little spice, maybe pepper? As I swirled the first mouthful I tasted more of a strawberry tone mixed with just a slight touch of oak. The finish was slightly tannin. I gave this one 3 corkscrews as it just didn't have the full bodied flavor that I like, to be totally honest. If you like a red that is a little less full bodied, this might be the wine for you. As it retails for about $35/bottle I probably won't be drinking it anytime in the near future. The fifth, and final, course was a slow cooked lamb shank with melted eggplant, a cardamom yogurt with black olive puree.First off another disclosure. I hate black olives and any hint of black olives! There, I said it. The lamb shank, on its own, was nicely prepared and melted in the mouth. Melted eggplant I didn't really get and didn't think it added very much to the dish. Anything that came in contact with the black olives I automatically took a pass on. Did I mention that I really don't like black olives? This course was presented well, I can say that. 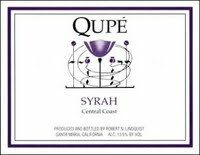 The final two glasses of Qupe' were the "Bien Nacida Hillside Estate" Syrah vintages 2001 and 2006. 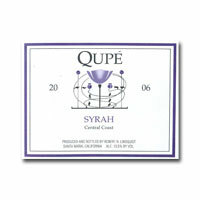 The 2001 Syrah arrived at our table and exhibited a dark, ruby red color. After swirling I picked up hints of raspberry and chocolate on the nose. On the palate very little to note other than a little bitterness and a little more tannin than I prefer. Hate to say it but it seemed a little plain and pedestrian to me. I gave it 2 corkscrews because it wasn't terrible it just wasn't memorable. Saw this one on sale on one of the internet wine sites for $26/bottle. Overpriced. The 2006 Syrah was a little better than the 01. This one had a nice, fruit forward nose with a little hint of allspice. On the palate a somewhat one dimensional wine with mostly blueberry and a hint of oak noted. Not much to say about the finish. This one gets 2 corkscrews as well. This one retails from $30-40/bottle. Overpriced! The evening was topped off with some "mignardises" which are basically some tiny one-bites masquerading as desserts. One was a little macaroon type of chocolate deal that wasn't too bad while the other was a coffee infused marshmallow type of thing that didn't do a whole lot for me. None the less it was a nice evening in a quaint setting with some great friends who just happen to also be our neighbors. Sit Long, Talk Much, Laugh Often, Drink Wine!